Introducing Snippet’s Mini-Cuts! We specialize in children’s hair cuts, offering our services in four uniquely designed children’s salons, each which are themed to capture a child’s imagination and to welcome them into a wonderland where they will feel safe and secure. Our kid’s hair salons are located in Lombard and three in Chicago. Snippet’s Mini-Cuts has themed designs in each salon, our salons also feature: novelty car and animal stations, video monitors that feature current children’s videos and video games. Our larger stores also provide a play area where children can play before or after receiving services and where siblings will be comfortable waiting. In addition to the quality hair services which we provide for children at Snippet’s, we have the most complete collection of children’s hair, bath and beauty products. Snippet’s works with unique vendors to bring you the finest shampoos, conditioners and styling products as well as hair toys, jewelry and accessories. Furthermore, we encourage local artisans and entrepreneurs to showcase their talents at Snippet’s. 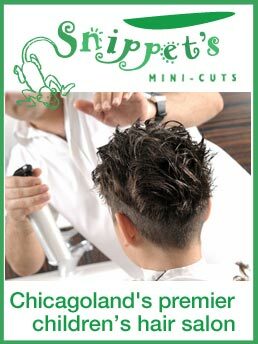 Snippet’s Mini-Cuts believes in supporting our communities! We are delighted to participate in local fund raising efforts by donating our services when requested in person. We will donate two Mini-Cuts to your organization or event. As well, we are pleased to join Children With Hair Loss in their effort to provide wigs to children in need. We will gladly offer our services at no charge to any child that has 10 inches of hair and is willing to participate.